APARTMENT IN VILLA GIOVANNA is equipped to for all your needs. the apartment in Villa Giovanna is located in Ragalna, on the slopes of Mount Etna 800 very pleasant dry, to spend days away from the stifling heat of the city. in winter the snow-filled volcano you can enjoy the finest skiing. We are 20 km from Catania Fontanarossa, the closest. 15 min from the Etna Park (UNESCO), it is also possible to reach the Rifugio Sapienza, we will find the cable car that will take you at 2850 S. L.M to appreciate breathtaking views and unspoiled nature. In addition to 20 min. Catania, where you can visit the historic fish market and not only that, but also a lot of history that this charismatic city says. A 40 min. you can appreciate the wonderful and enchanting tourist resort people who like a bit 'of fun and entertainment for children only 15 min. there is the amusement park ETNALAND. The apartment in the villa is 100 square meters, ground floor surrounded by a beautiful garden with lawn and rose gardens, available to guests for exclusive use the outdoor swimming pool. the apartment has 2 bedrooms, one with a double bed plus two single beds and a bathroom with shower, and a second bedroom with a double sofa bed, fridge in the bedroom, also with bathroom. it is possible to book the whole apartment or separately, the area, where you want to stay es. 4-bed room with kitchen and private bathroom, or alternatively double room 2 places only with private bathroom or the whole apartment, obviously with different rates. It 'also a fully equipped kitchen with refrigerator, gas stove + oven + microwave + blender, cutlery and kitchen utensils .Each room has complimentary toiletries and hair dryers. The rooms are equipped with flat-screen TVs. 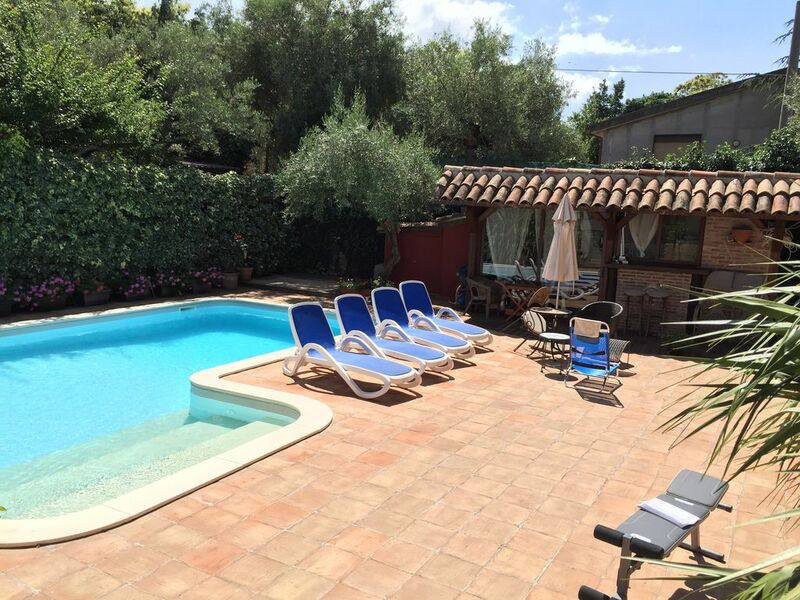 For the apartment's customers, Villa Giovanna, the outdoor pool is available for private use for guests. We are in an ideal area for hiking, mountain biking, ski tours, guided tours with experts on Etna craters, and many other interesting areas and urban centers located on the slopes of the volcano where you can visit the stone quarries lava and various jobs that can be drawn. Consalvo family during your stay will assist you on all your needs if you want you can dine by the pool with music. (Of course by reservation and is not included on the room rate, it is an extra). you can ask your arrival. The property has 2 large bedrooms with comfy beds, the kitchen has quite basic facilities for self catering which is why only 4 stars. There is plenty of space outside to use and relax and although the owner lives above the apartment they respect your privacy. The owner and family were very helpful and welcoming with plenty of advice about the area. We would book again if returning to this region of Sicily. Dear Guest, thank you for your review! We are happy to host you again in our proprety. Buen alojamiento y propietarios muy amables. Grazie tante , siamo felici di avervi soddisfatto. Un abbraccio a tutti voi!